Democrats celebrate the announcement of President Barack Obama's re-election Nov. 6, 2012 at Wesley's Bar in downtown Toledo. Nearing the end of a disappointing night, Samuel "Joe the Plumber" Wurzelbacher (right) speaks with Alfonso Narvaez. Wurzelbacher (R-OH) was defeated in the 9th District of Ohio by Marcy Kaptur (D-OH). Downtown Toledo came out in droves of red and blue Nov. 6 to support their political candidates of choice. Democratic supporters gathered at Wesley’s Bar while Republicans gathered at Tony Packo’s at the Park, all hoping to watch their respective parties claim the highest office in the United States of America. After a vigorous presidential campaign trail, the citizens of America spoke, and their voices called for President Barack Obama to remain in the White House. It was about 11:30 p.m. when national news stations began reporting that Obama had won the pivotal state of Ohio and with it, a second term in office. Sitting just short of the 270 Electoral Votes required to win the election, news broke that the incumbent President has secured Ohio and Florida, guaranteeing victory Governor Mitt Romney. President Obama also won the popular vote by over 2.6 million votes. At Wesley's, Democrats celebrated as President Obama captured first Florida and then Ohio, two swing states recognized as election changers. “He had an incredible ground campaign in Ohio that overcame the millions of dollars from Super PACs,” said Linda Furney of Toledo, Ohio. Furney said she was thrilled not just for the U.S. but for the world because President Obama "understands the issues and doesn't hate women or minorities." Janet Rogolsky voted for Obama and was elated by the win, saying she believed the President delivered in putting the country on the right track. He was blocked by a split Congress but worked hard to push ideas that are good for this country said Rogolsky. Throughout election night, hopes remained high at Packo’s, with Republicans confident of a win. Samuel “Joe the Plumber” Wurzelbacher (R-OH), who staged an unsuccessful run against incumbent Congresswoman Marcy Kaptur (D-OH), said he felt government needed people who had worked private sector jobs, such as Romney and himself. But as results continued to pour in from around the country, it became clearer that Gov. Romney would not be taking office. “We just have to pick up the pieces and keep fighting,” said Matt Berry, a supporter at the Republican party. Vice President Joe Biden was liberal with his praise during his Oct. 23 visit to The University of Toledo. Biden was in Ohio to build support for the upcoming presidential election. His early comments lauded Representative Marcy Kaptur (D-OH), who introduced him, along with supporting the UT football team. “If we had 100 more like her in Congress everything would run more smoothly,” he said of the 15th term congresswoman. “She has more decency in her little finger than most have in their entire bodies Biden told the crowd of about 1,500 guests. When discussing President Barack Obama’s odds at re-election, Biden said he thought Obama would do to them what the UT football team did this past weekend. “Y’all got a ball club,” said Biden, referencing UT’s 29-23 recent victory over ranked University of Cincinnati. After the pleasantries, Biden moved his talk back to the policies of the pending election. His appearance came the morning after the final presidential debate in Florida. Biden said Obama acts on principles, rather than changing his policies to match voter sentiment. Never once has President Obama turned to me, on Bin Laden or the economy, and asked what the politics of a choice are, Biden said. The president acts on principles and believes he is doing the right thing. Biden said that Gov. Mitt Romney was in a hurry to agree with Obama on foreign policy during the debate. “Only thing consistent about their talk about policy is they are inconsistent,” the Vice President quipped. He said the other place they just don’t get it is women’s rights. When Romney was asked about plans to ensure equal pay for women and men, he never answered the question,” Biden said. Values came into question when Biden asked about where Romney has sent jobs and given tax breaks. It is better to show where your values lie than it is to tell people, Biden said. The governor said he didn’t outsource jobs, he off-shored them, but that doesn’t matter to the American that lost their job, he said. During Obama’s first term the unemployment rate in Ohio dropped below the national average, Biden said. That has to do with his desire to save the automotive industry in America, noting that 100,000 jobs have been created through the auto industry during the Obama administration. Early during his first term, Obama approved bailouts to the American automotive industry. Biden said that to keep current tax breaks for the middle class permanent, Republicans are asking for $500 billion dollars in tax cuts for America’s wealthiest families. He compared that to asking banks that were bailed out to pay just pennies on a $100 to create a security fund for homeowners. These are the people Romney refers to when he talks about 47 percent: the family with kids, the veteran soldier and the elderly, Biden said. There is no quit in America, we are bringing our country back, Biden said. There is only one direction to go, and that is forward, and it’s never been a good idea to bet against American people. “We win Ohio, we win the election. God Bless you all and may God protect our troops,” Biden said. The presidential political battle waged on as Ohio became the next step in the fight for the presidency. 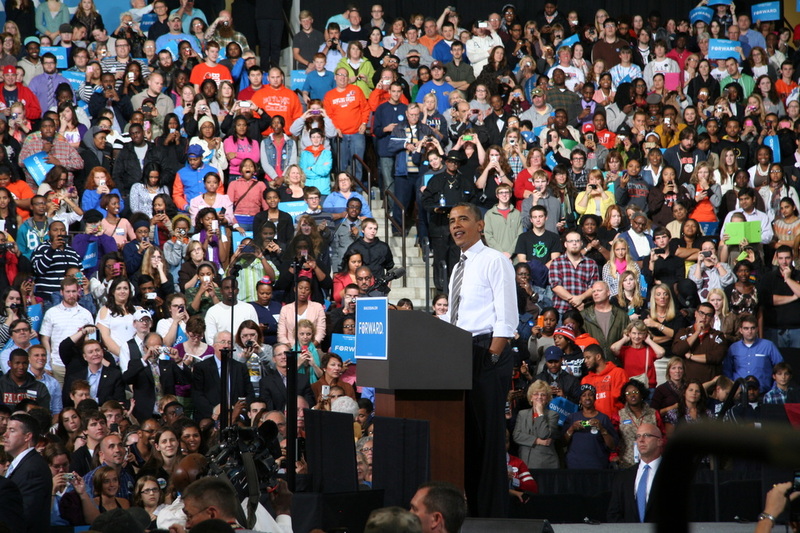 With stops In one of the three biggest, critical swing states, President Barack Obama and Gov. 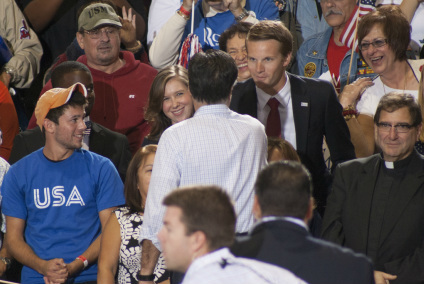 Mitt Romney squared off as they laid out their plans for the country. Fans flooding the floor, cameras flashing and echoing cheers. The scene was set for each candidate to share his views and explain his plans for the future. To register to vote, find your voting location, or for early voting information, click here. Obama Speaks to Crowd in B.G. 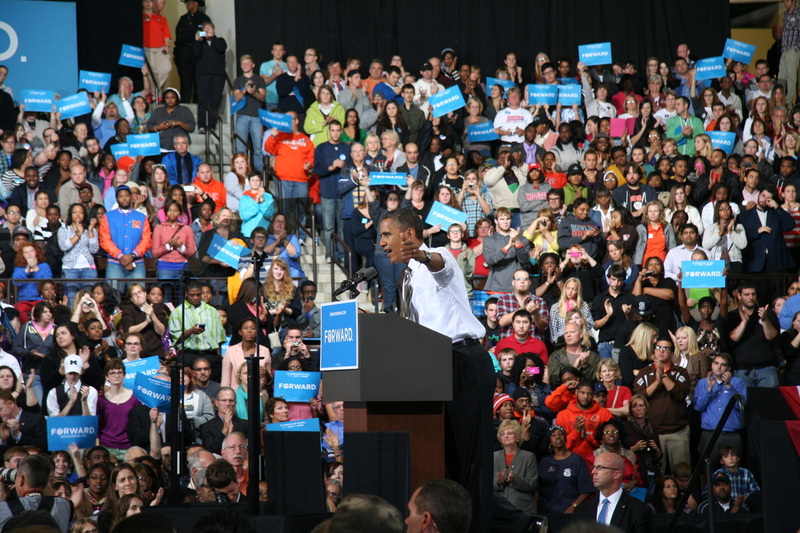 Amid loud cheers, President Barack Obama promises to increase jobs and rebuild the middle class, reduce the deficit and support affordable education for all people. Seth Melchor, a senior at Bowling Green State University, had the opportunity of a lifetime when he introduced President Barack Obama at Bowling Green State University. Melchor told the audience of more than 5,000 that growing up, he did not always think college was an option. He and his three siblings were raised by a single father and the cost of attending seemed unmanageable. But a federal grant and low-interest loans were his solution to pay for college. Money that was available to him because of President Obama’s push for affordable education, he said. “Education is not a privilege for few but a right for many,” he said amidst loud cheers as President Obama took the stage. He then switched to a more serious mode, telling the crowd the choice was between two very different paths; his opponent’s plan to cut taxes from the top down. We succeed when the middle class gets bigger and more people have the chance to live up to their God-given talent, he said. 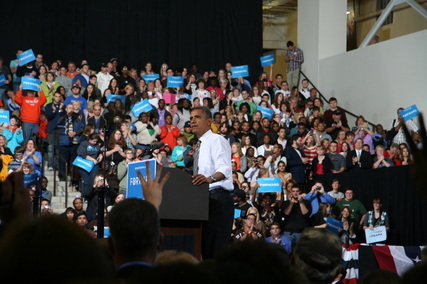 Obama told the crowd he didn’t see victims or people asking for handouts, but hardworking Ohioans. He described students trying to work their way through college, single mothers putting in overtime, veterans who had proudly served their countries and soldiers who currently serve. He was quick to say that no one is entitled to success, he does believe everyone deserves a fair shot. 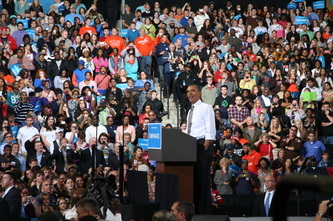 Obama told the audience that America has the best workers, businesses and colleges in the world. And he acknowledged that while the country’s problems will not go away overnight, they can be solved. “No country would not gladly change places with us,” Obama said. He said the United States can create 100,000 new manufacturing jobs in the next four years. But that achieving that would require the end of outsourcing jobs. Gov. Romney talks tough about the Chinese but that’s like a hen saying we need more secure chicken coops,” Obama said to cheers. Obama said during his presidency the United States has doubled the amount of clean energy and is less dependent on foreign oil than any time in nearly 20 years. We have brought more trade cases in my one term than the Bush office did in two. Let the record speak for itself, he said. We need to give more Americans the chance to compete. Education is the path to middle class life, Obama said. Giving people the same opportunities is what America is all about. We can do that by asking the wealthy, those making more than $250,000 a year, to pay a little extra so we don’t burden the middle class, Obama said. That single move could cut spending by a trillion dollars, he said, adding that the middle class spends money it gets back. Clinton regime and will work again. I refuse to ask middle class families to pay for millionaire tax breaks,” he said. No American should spend their golden years at the mercy of insurance companies, and I will never turn Medicare into a voucher. Obama then turned his attention, saying four years ago he promised to end the war in Iraq, and it is over. “A new tower rises above the New York skyline, Al Qaeda is on the path to defeat, and Osama Bin Laden is dead,” Obama said. After a decade of war it is time to do some nation building, Obama said. No soldier should come home from defending our country and have to fight for a job. And because of the American people this is possible. They have given the single mother health insurance, the factory worker back his job, the college student support, the immigrant child security, and the homosexual the right to defend his country no matter who he or she loves, Obama said. Hard work is an American value, it is not reserved to the Red, the Blue, the 47, the 53, the rich or the poor, he said. In taking office in 2008, I didn’t receive 47 percent of the vote, Obama said. Gov. Romney (R-Mass.) shakes hands with supporters after concluding his speech. Those were the words on the banner behind Gov. Mitt Romney as he spoke at the Seagate Centre yesterday. And those were the words that defined Romney’s address to a crowd of about 4,000. Both Romney and President Barack Obama toured Northwest Ohio Sept. 26, 2012, each of them intent on winning Ohio in the Nov. 6 election. Ohio has long been considered one of the most important swing states in the country. Other critical states include Florida and New York. Romney’s campaign stop in downtown Toledo happened just hours after President Barack Obama spoke at the Stroh Center in Bowling Green. Speaking for nearly a half hour, Romney criticized President Obama’s four years in office. “Do you want four more years with 23 million people struggling to find a job?” he asked. “Do you want four more years where half our kids coming out of college can’t find a college-level job? Supporters’ cheers and comments indicated they’ve had enough. Visuals throughout the auditorium also reiterated the night’s theme of a country mired in debt, in need of repair. Romney referenced the clock several times as he stressed the importance of cutting the national budget deficit. Balancing the budget was only one of Romney’s five major steps to take America’s economy in a new direction. His other four points included taking advantage of America’s energy resources; opening new avenues of trade while outsourcing fewer jobs to China; ensuring U.S. citizens are trained for success in the workforce, and helping small businesses grow. He said President Obama plans to increase taxes on small businesses, which will hinder job creation. “Small business is where jobs come from,” Romney said. 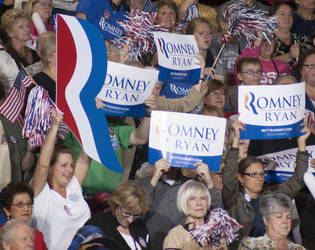 Romney’s supporters agree that his economic plans will create more jobs for the United States and the Toledo area. “I think Romney will help create jobs because of his business background,” said Kevin McLeod, a local student and Romney supporter. 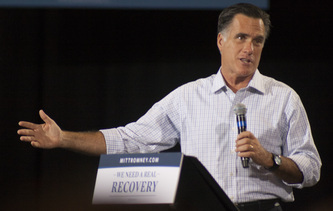 Themes of job creation and economic revitalization were prevalent throughout Romney’s speech. Romney supporters were clear in their agreement. “A Romney presidency would bring more confidence and less government to the American people,” McLeod said.